As we skip into springtime, dumpling soups are the perfect transition to make those warmer days seem that extra step closer. One of my absolute wontons you can buy is from Takapuna restaurant, Madam Woo (pork and lap cheong sausage deep-fried deliciousness) and having never cooked with Chinese sausage before, I wanted to put my spin on things - and that's where this little number was born! 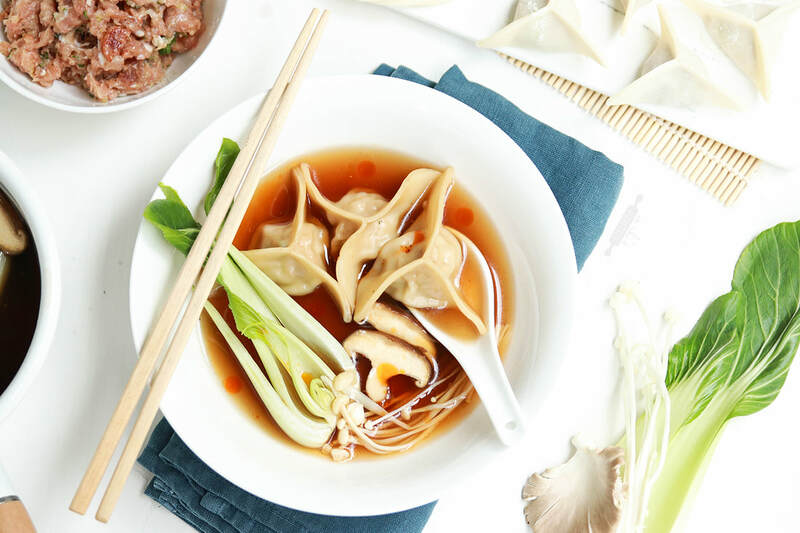 Juicy pork and Chinese sausage dumplings flavoured with ginger and garlic swim happily amongst al dente bok choy and earthy mushrooms in an incredibly easy and simple stock based soup; coming together harmoniously to make the perfect evening meal. I'm in love with this recipe! In a frying pan, lightly fry the sausage for a couple of minutes to release the fat. Transfer to a large bowl. To the bowl, add the pork mince, spring onion, minced ginger, garlic, coriander, 2 tsp sesame oil, 1 Tbsp soy, 1 tsp chilli oil and white pepper to taste. Mix well until all of the ingredients are fully combined. Wrap the filling in the dumpling wrappers* and set onto a floured tray. To make the soup, combine the stock, ginger piece, cooking wine, plus remaining sesame oil, soy and chilli oil in a pot. Bring to a light boil, the submerge the dumplings in the soup. After 3 minutes, add the mushrooms and bok choy. Cook until the dumplings rise to the surface, then divide amongst bowls and enjoy immediately.